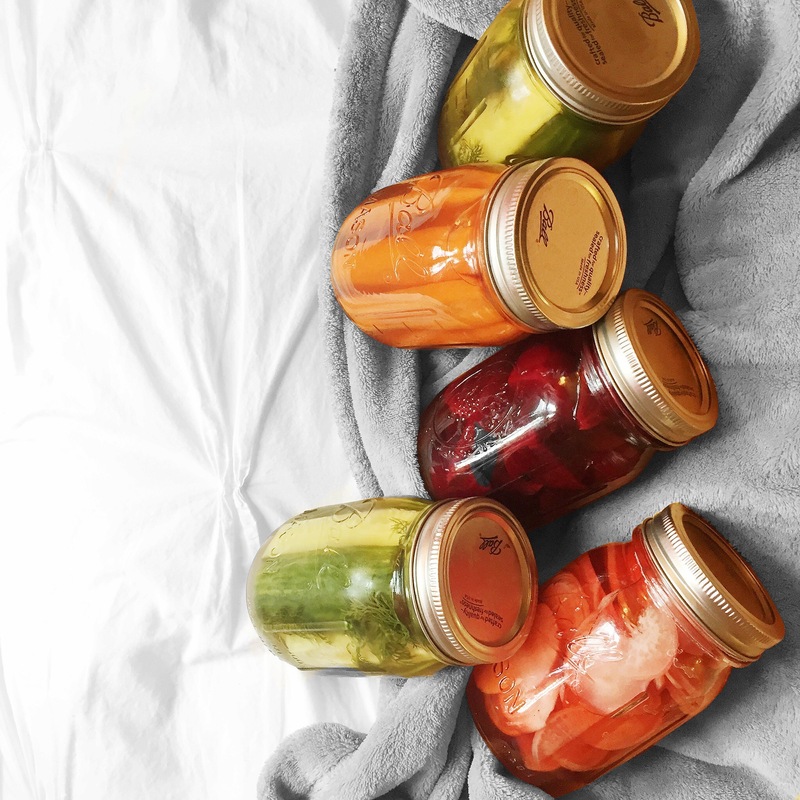 Lately I’ve become obsessed with preserving my veggies. 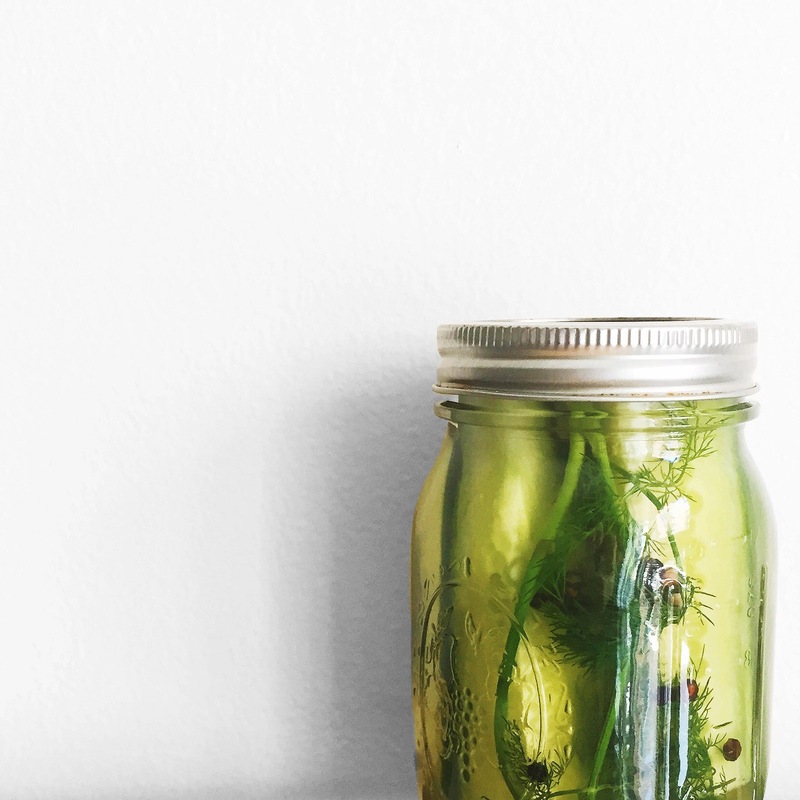 It all started last week when I decided to put my mason jars to good use and make some pickles. You know, making pickles isn’t as hard as it seems. You only need cucumbers, some jars and a type of brine. The downfall? You have to wait three to four days until they are ready to eat. BUT, they are well worth it and they last for a long time. Naturally, after my success with the cucumbers, I moved on to the big leagues. The process was basically the same, except I sweetened the brine just a little bit. Plus, the waiting time is only one day. Now I have a variety of pickled vegetables to choose from for my salads or just for munching. Here are the recipes. Trust me, it’s extremely easy stuff. Also make sure you sterilize your jars beforehand! To make the brine add water, vinegar, salt, peppercorns and garlic powder into a saucepan over height heat. Once it comes to a boil, reduce the heat and let it simmer for 5 minutes. In the meantime, wash and slice the cucumbers. Place the cucumbers and the baby dill into the jars. Then fill the jars with the brine, and wait for all the bubbles to come up. Place a spoon into the jars to help eliminate the bubbles quicker. Once that is set, close the jars and let them sit. 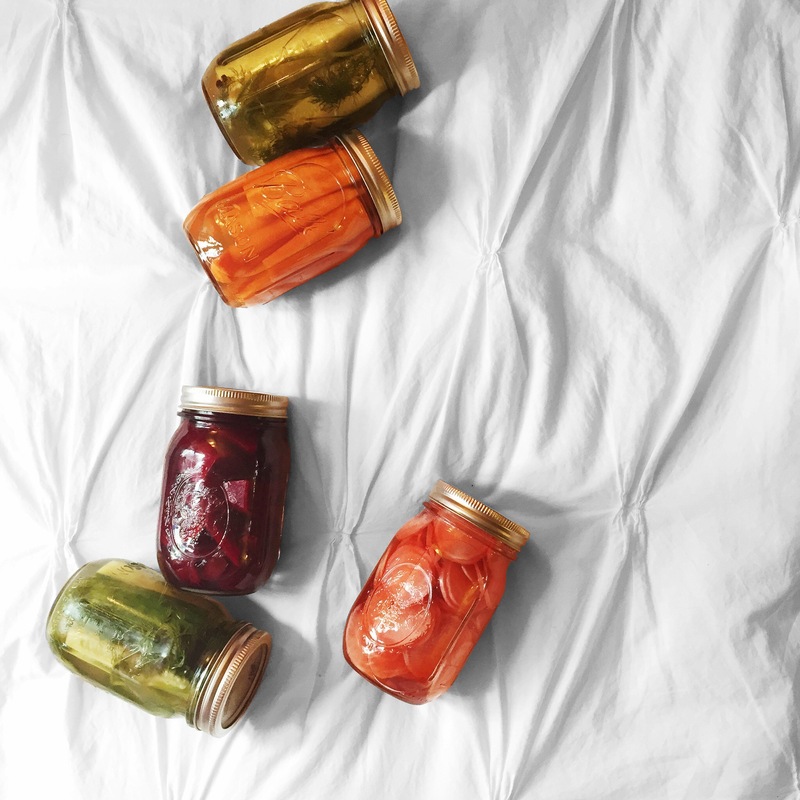 Once the jars are cooled, place them into the fridge for 3 to 4 days. Enjoy them for a few months. To make the brine add water, vinegar, salt, brown sugar, cinnamon, and nutmeg into a saucepan over height heat. Once it comes to a boil, reduce the heat and let it simmer for 5 minutes. In the meantime, wash and slice your choice of vegetables. Place them into the jars. Then fill the jars with the brine, and wait for all the bubbles to come up. Place a spoon into the jars to help eliminate the bubbles quicker. Once that is set, close the jars and let them sit. When the jars cool, place them into the fridge and wait 1 day before opening them. Cut the beets into 4 and boil them for 10-15 minutes until tender. Drain the beets and wait for them too cool a little. Once they are cool the skins should come off pretty easy. If they don’t, simple peel it off. Use gloves if you want to avoid getting red stains on your hands. Place the beets into the jars and fill them with the brine. Wait for all the bubbles to come up or place a spoon into the jars to help eliminate the bubbles quicker. Once that is set, close the jars and let them sit. When the jars cool, place them into the fridge and wait 1 day before opening them. 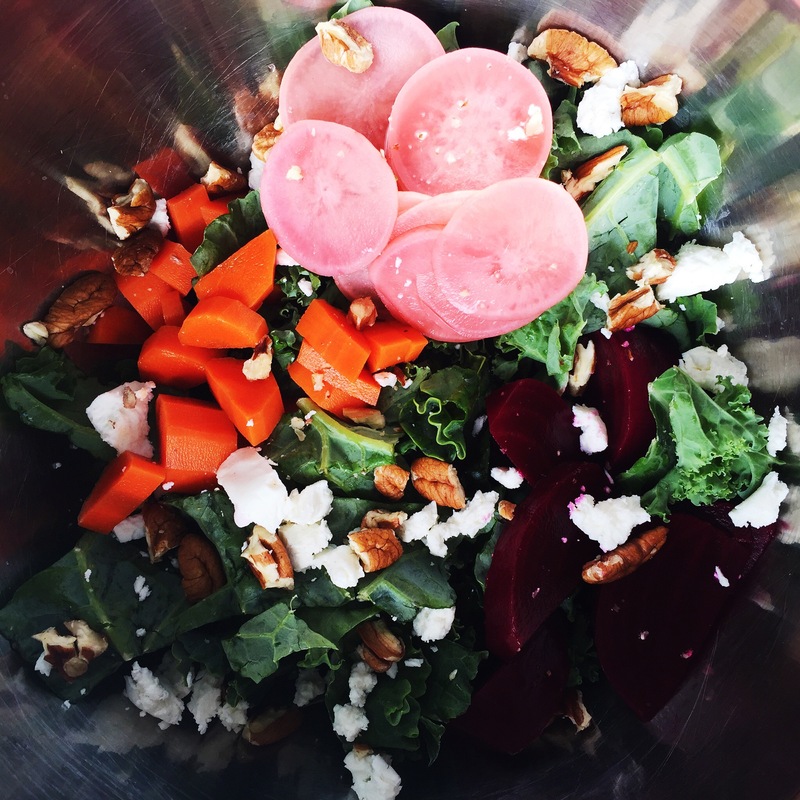 Made a yummy and quick salad with all my pickled vegetables (except, well, the pickles), some goat cheese crumble and pecans on a kale base. The vegetables are so packed with flavor that I didn’t even need dressing. 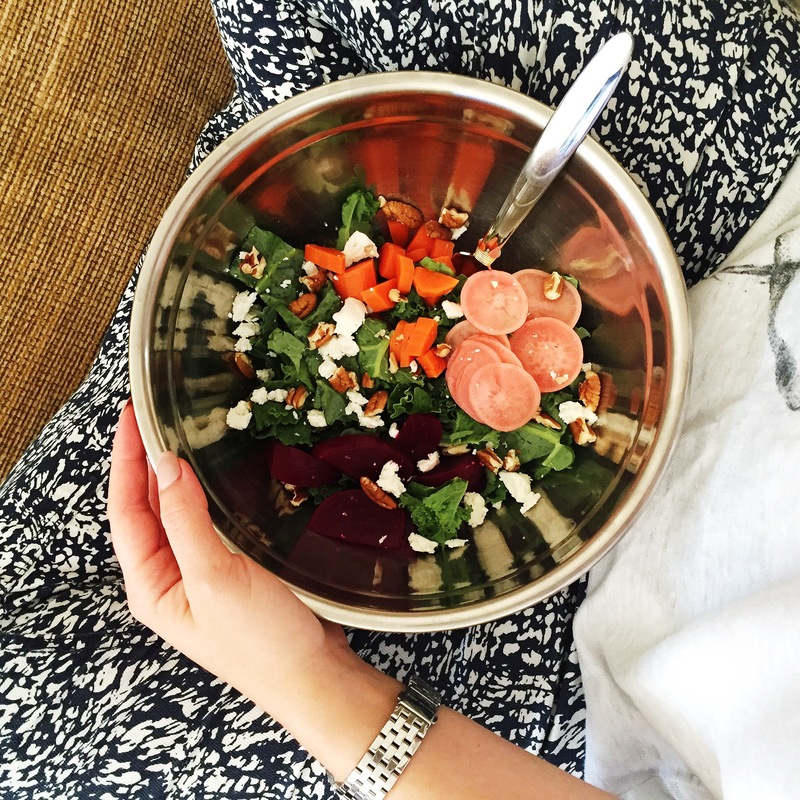 Talk about a healthy lunch.